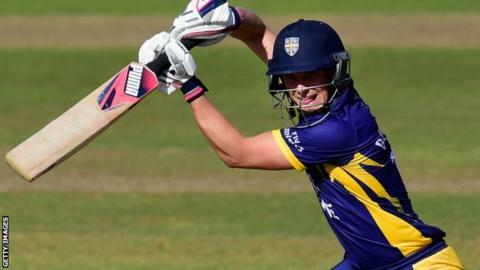 Scott Borthwick shone with bat and ball as Durham stayed in the hunt for a One-Day Cup quarter-final place with a 146-run win over Leicestershire. The margin was the same as the stand between Mark Stoneman and Borthwick that led them to a total of 349-7. Stoneman was caught two runs short of a century and Borthwick was run out for 87, while debutant Liam Hurt took 2-59. Lewis Hill (86) and Niall O'Brien (50) put on 99 in reply, but Borthwick's 5-38 saw them dismissed for 203. Durham's third win of the competition lifted them to fourth place in Group A with one match to play, against Derbyshire on 17 August. They are a single point ahead of Derbyshire and Northants, who both have a game in hand. Leg-spinner Borthwick's figures were his best in limited-overs cricket and he finished the game by bowling Hurt and Atif Sheikh in the space of three deliveries. Leicestershire have yet to register their first victory of the summer in the 50-over format, although the performance of 24-year-old Hill, who hit a six and nine fours in his 86-ball innings, provided a further indication of his potential.